Oracle release the first Update (RU) 18.2.0 on April 2018. 18.2 Release update released on April18. If not we need to upgrade the Opatch utility version to 12.2.0.1.13 . 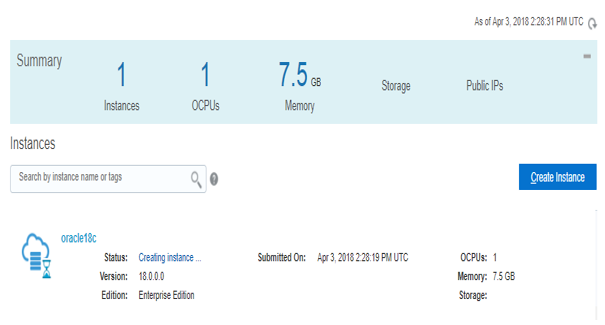 Step 1: Log in to your Oracle Cloud services account, go to the Oracle Database Cloud Service page, and create a new service:- For Instance Name enter oracle18c. 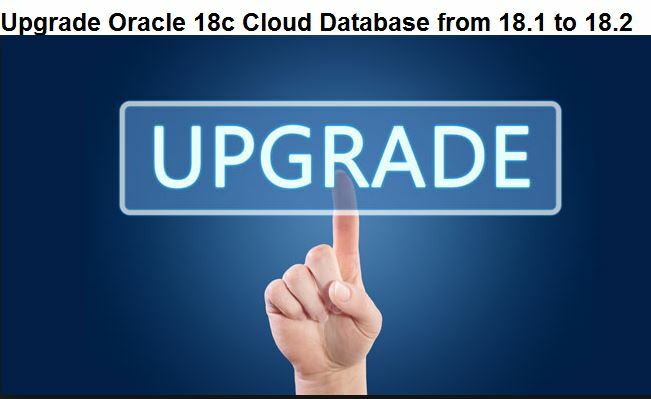 – From the Software Release list, select Oracle Database 18c. – From the Software Edition list, select Enterprise Edition. – From the Database Type list, select Single Instance.Then click Next to continue. 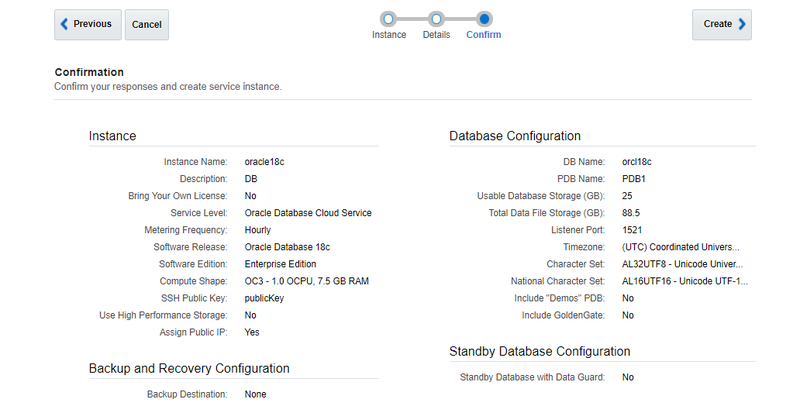 Step 2: In the Service Details screen, do the following:- For DB Name (SID), enter oracle18c and PDB Name, enter PDB1. – Set an administrative password of your choice and confirm the password (this will be your sys password). – For Usable Database Storage (GB), enter 25. – From the Compute Shape list, select OC3 -1.0 OCPU, 7.5 GB RAM (this is the bare minimum required). – For SSH Public Key, enter publickey. 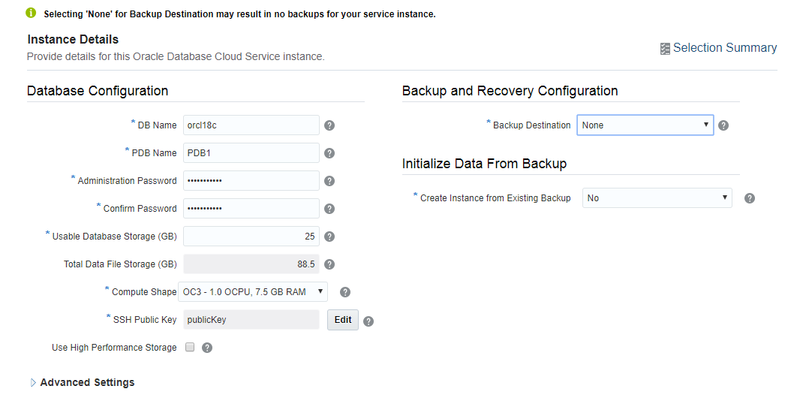 Step 3: Finally, review the configuration and click Create to create your cloud database. We need to generate a public key and private key to use cloud instance. Open an instance of the PuTTY executable and connect to the Oracle Database Cloud Service compute node using an SSH public key. • It is not Rac database so we need to shutdown the databases and listeners associated with Oracle home. • Go to the Patch directory and unzip the patch (27606517). • Run the Datapatch Utility for load the modified sql files into database. • Finally checks the dba_registry table. Step:4 Query to check Patch has been applied physically. Here successfully applied the RU patch and upgrade the Cloud 18c database.